You will have to remove enough keys so that the strip you need to replace is uncovered. While some strips span just four or five notes, most cover an entire octave. So remove all of the keys necessary to uncover the entire strip. 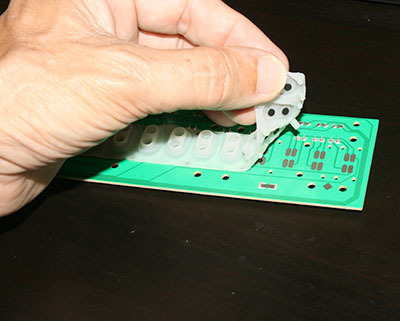 Then, grab the strip by a corner and gently lift it away from the printed circuit board (PCB). The strips have rubber nubs that fit into holes in the PCB, so work these nubs free gently; if you yank too hard and fast, you could tear or damage the rubber strip. Note that the strip has two contacts per bubble, one higher than the other. You will need to orient the new strip in the same way on the circuit board. Place the new strip in position, and use a toothpick to gently work the nubs into the holes. Once the strip lies flat against the circuit board, you can replace the keys. If you get everything back together and find out that the repaired notes always play at maximum velocity or otherwise don't work correctly, you have probably installed the strip backwards. Remove it, switch it around end-for-end, and reinstall it.